There is no set time for this scene. 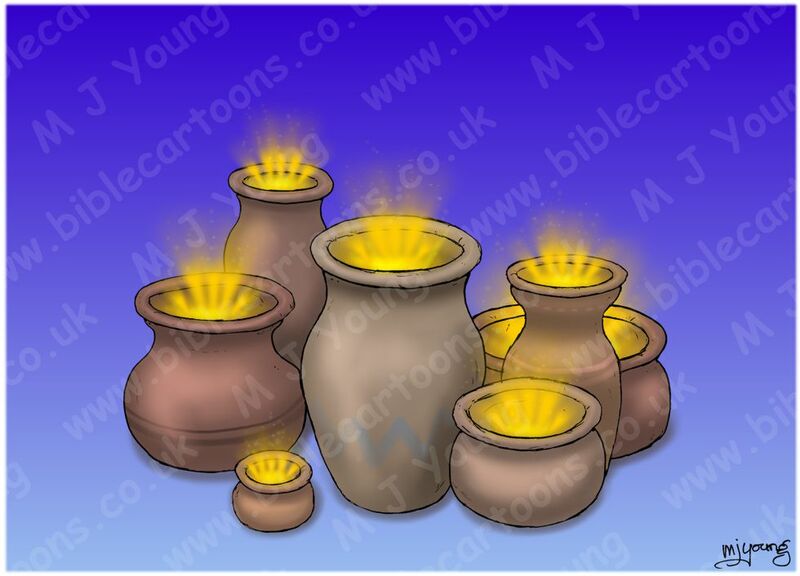 The glow from the jars of clay provides a warmth to the tops of the jars. There is also top, left lighting from above, which casts some shadow to the bottom right of the jars. This picture didn’t take me very long to draw or colour, yet I think it has come out very well, & is quite striking, even in it’s simplicity. However, we possess this precious treasure [the divine Light of the Gospel] in [frail, human] vessels of earth, that the grandeur and exceeding greatness of the power may be shown to be from God and not from ourselves. What is the “treasure” mentioned by the Apostle Paul? 5 For we do not preach ourselves, but Jesus Christ as Lord, and ourselves as your servants for Jesus’ sake. So the treasure Paul is referring to is the knowledge of the glory of God, which is made known in human form to us in the person of Jesus the Christ. Once a person “gets” the message of salvation through Jesus, & becomes a born-again Christian, then they have the treasure spoken of by Paul in their heart. We do not save ourselves; salvation comes to us as a gift. Even the understanding of our own sins & need for repentance & a Saviour is not of ourselves. It all comes from God, as does the gift of faith needed to make the leap from sinner to saint. 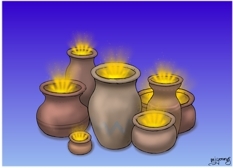 What is meant by the “jars of clay”, or “earthen vessels”? The outcome of bearing this treasure; the results it produces, are glorious and amazing. But the bearer of the message is a mere mortal person. This is why Paul contrasts the amazing “glowing” treasure within, with a jar of clay, or earthen vessel. The visual contrast is striking, & meant to be so. There is nothing amazing or glorious about us human beings… but the message or treasure that Christian’s hold IS! 7 I became a servant of this gospel by the gift of God’s grace given me through the working of his power. 4 My message and my preaching were not with wise and persuasive words, but with a demonstration of the Spirit’s power, 5 so that your faith might not rest on men’s wisdom, but on God’s power. Clearly Paul wanted his listeners & readers to clearly understand that it is not our own clever ness which saves us, it is ALL God’s doing, from start to finish. Man’s clever words will not give sufficient impetus to make us change our ways & turn away from our wrong-doing. Only the power of God Himself can help us to make such a vast leap from the kingdom of darkness into the kingdom of light, yet we have our part to play: we have to agree with God to MAKE the leap!